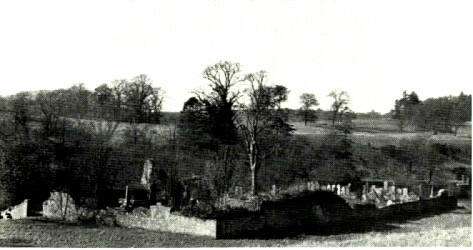 and the Churchyard and Port of Menteith with links are found HERE. You will need to try a name in the search box. 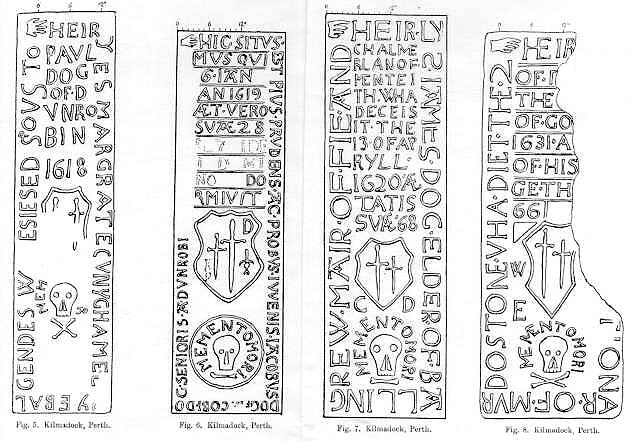 Excerpt from: D. Christenson, The Carvings and Inscriptions of the Kirkyard Monuments of the Scottish Lowlands, (Edinburgh: Neill, 1902), pages 15-21. 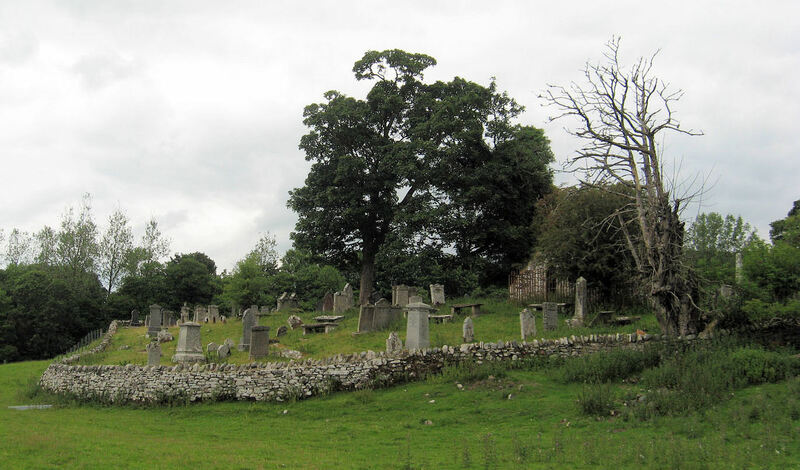 The churchyard of Kilmadock, with its long, abandoned and ruinous kirk, is beautifully situated on the north bank of the Teith, about two miles above Doune. The parish is not mentioned in the Origines Parochiales, neither is its history given in the Red Book of Menteith, but according to the Old Statistical Account of Scotland (1793), the site was originally occupied by a monastery to which six chapels were attached, remains of all which still existed in the parish in 1793, although all traces of them have now disappeared. 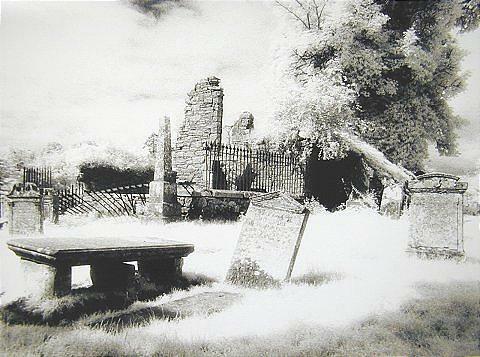 The church, having become ruinous in 1744, was taken down, and a new one was built at Doune in 1746. 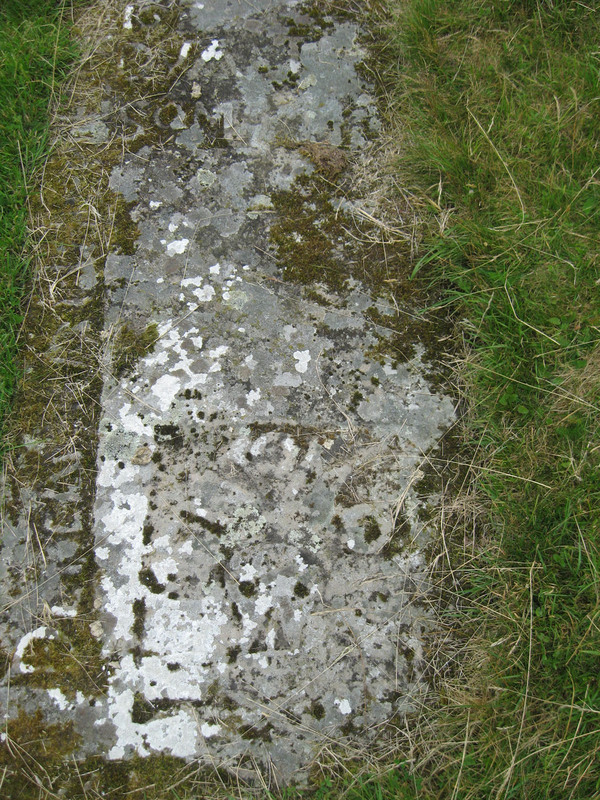 By far the most ancient monument now to be seen in the churchyard is the black-letter slab already noticed (fig. 1) [drawing not included]. Following at a long interval, the seventeenth century is represented by at least twelve monuments, of which nine are of the first half of that century, and at least four of these are in memory of farmers or mechanics. Lying beside the black-letter slab are four other slabs commemorating a family named Dog. (the ancient form of Doig). This family was of considerable importance in Menteith from an early period. James Dog witnesses a charter of Queen Margaret in 1528, and in the same year Jacobus Dog, Junior, witnesses an agreement. A precept of Queen Margaret in 1529 is addressed "to our lovittis Walter Dog our mayr of fe (Footnote: the Mair of Fee was a hereditary officer under the Crown, whose power seems to have resembled in some respects that of the present Sheriff-Substitute.) within our lordship of Menteith," and on the same date another "to our lovittis Walter Dog, (and) Andrew Doin our officiaris in that part." 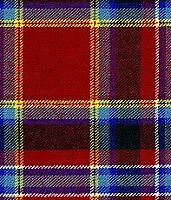 In a discharge by Queen Mary of Scots in 1567, "the miln [mill] and miln lands of Cessintully pertening, to Paule Dog" are mentioned. 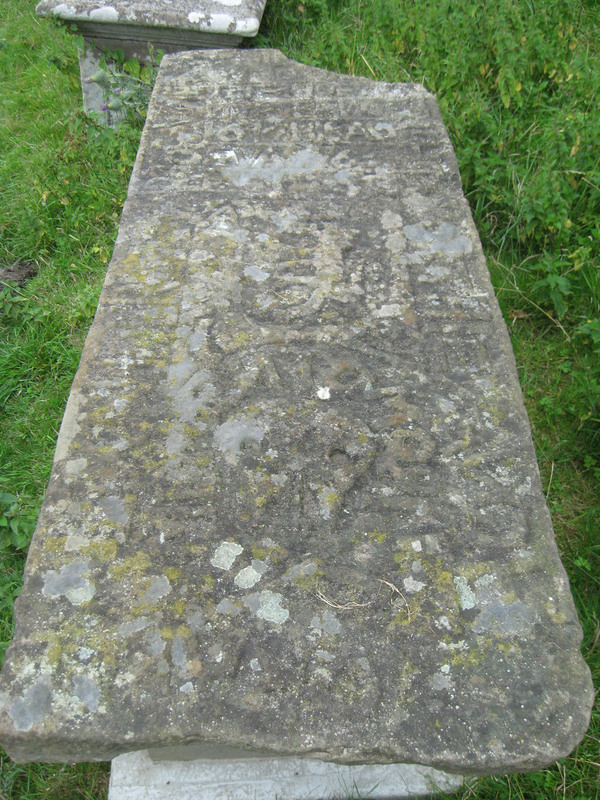 The four slabs resemble each other in being about 6 feet long and rather narrow; in having an inscription in relief, going first round the margin and ending within it in the upper half of the stone (a common arrangement in the seventeenth century); and in having lower down a shield, and below that a death’s head with the motto, "memento mori." Each shield displays two daggers, or a sword and dagger, but one of the shields has in addition two objects, one nearly defaced, the nature of which is obscure, and the letter D.
The earliest of the slabs (fig. 5) is dated 1618, and the carving is rude, the letters being irregular in size and spacing. The inscription is partly effaced, but is in memory of "Margrate Cunnyghame, spous to Paul Dog of Dunrobin," a place that must almost certainly have been in Menteith, although I cannot find it on a map [Dunrobin is a farm near Ashentree on the Coldoch Estate.]. She is described as L … YE BALGENDES [ read LADY CRAIGENDES], but that name also does not seem to exist now in Menteith. The small P tacked on to the S of spous is peculiar. The next slab (fig. 6) is dated 1619, and bears a Latin inscription in honour of the PIUS PRUDENS AC PROBUS JUVENIS JACOBUS DOG, F(ILIVS) JACOBI DOG SENIORIS A DUNROBIN. The rest of the inscription is much defaced, but "ÆT. VERO . SV Æ 28" remains, and it ends with "DORMIVIT." His shield is the exceptional one already described. The inscription is much more regularly cut than in the last, and the only peculiarity is that Filius is represented by t very small F, there no other contracted word. The third slab (fig. 7), dated 1620, records JAMES DOG ELDER OF BALLINGREW MAIR OF FIE AND CHAMBERLAN OF MENTEITH. We have already seen that nearly a century earlier the office of Mayor of Fe and Officiar of the Crown was held by a Walter Dog, no doubt of the same family. A considerable portion of the fourth slab (fig. 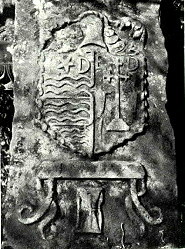 8), was destroyed by the fall of a tree, but the shield with the two daggers indicates the monument was to a DOG, and the inscription tells that he was Portioner of Murdostone, and died in 1631, aged 66. The two places above mentioned, Ballingrew and Murdostone, still exist as farms. 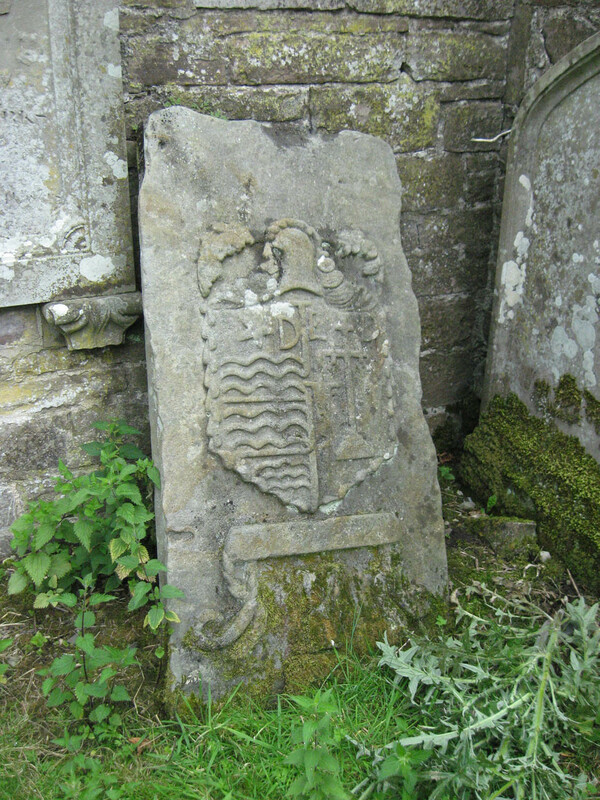 The kirkyard contains another monument, dated 1689, which possibly indicates the prominence of the same family in the district three or four centuries still further back. This is a small slab (fig. 9) leaning against the wall in a railed enclosure. 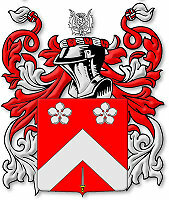 At the top, beneath a helmet and mantling, is a shield: on the dexter side are what is no doubt intended for the arms of Drummond, with the initials I.D. [John Drummond, the son of Harie (Harold) Drummond, 8th Laird of Deanston, and Helen Atcheson]; and on the sinister a calvary cross, sword and dagger, with the initials E.D. Now as the same letters occur on the black-letter slab (fig. 1), it is not an extravagant supposition that the E.D. 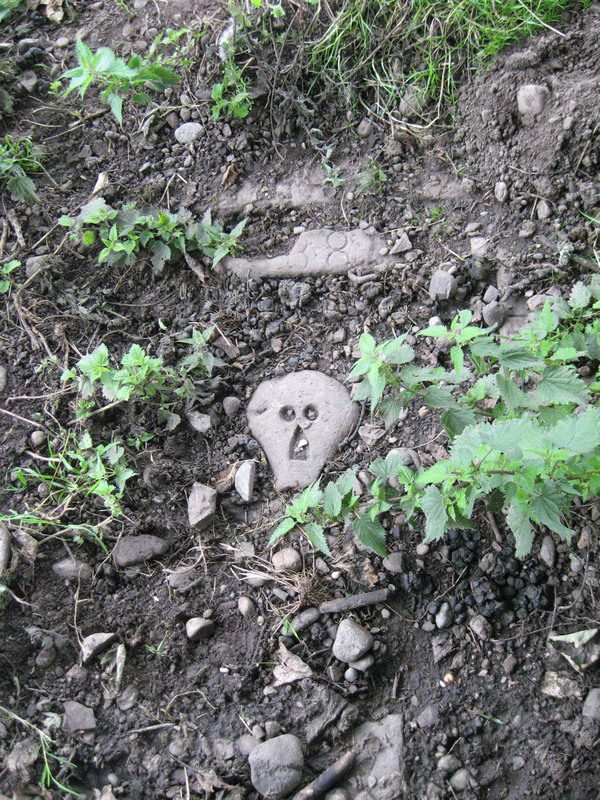 [Elizabeth Dog, daughter of David Dog and Marion Dog] of 1689 was a DOG, and believed that slab to be an ancestral monument. Mackay, Moray S., D.F.C., F.S.A. (Scot. ), Kilmadock in Dunblane Diocese - An Almost Forgotten Site in "The Society of Friends of Dunblane Cathederal," Vol. XI, Part III, (A. D. Garrie & Sons, Auchterarder, 1972), pages 83-85. Photos by Carl-H. Buettner. The parish of Kilmadock lies between Dunblane and Callander with its focal point the Burgh of Doune, where the 14th century Castle, perhaps the finest example of its era, stands above the River Teith.